We have a wide range of products, with all the popular traditional favourites alongside our new ranges. Whether you know exactly what you want, or you have a new recipe you’d like to try, or you even just have a vague idea of what you need, our butchers will help you to find just the right cuts, in any quantities. We supply in small or large quantities, for the individual, the family, the restaurant or business. Nothing is too much trouble and we’ll help in any way we can. We source our Scotch beef, lamb and pork from the best farms in Perthshire and Angus. We know the farmers personally and have worked with them for years. Beef products include fillet steaks, sirloin steaks, roasts, mince, sausages, burgers, braising steak, beef olives and chateaubriand. Lamb products include shoulder, neck, rack of lamb, cutlets, mince, sausages, burgers, chops and leg of lamb. 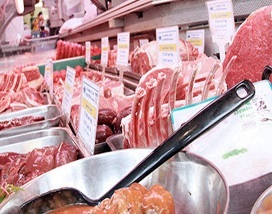 Pork products include steaks, loin, spare ribs, mince, sausages, burgers and pork belly. Chicken products include legs, fillets, breast and whole chicken. We make a mouth-watering selection of cooked and ready-to-eat foods. 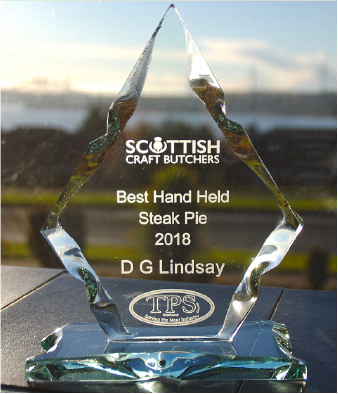 Choose from our award-winning steak pies, chicken pies, pots of stew or mince, sausage rolls or bridies. We bake them in our own on-site bakery so you can be sure of the quality and freshness. You can even buy our special DG Lindsay & Son gravy. We cook all of our own cold meats in-house, such as silverside, gammon, rib roast, chopped pork, shoulder ham, corned beef and potted meat. It’s all ready to be sliced to your own specification. Sausages and burgers are a classic favourite, whether you’re sizzling them over the BBQ coals or cooking them in the oven. Our delicious hand-made sausages and burgers are available in a variety of flavours and different meats (pork, beef, chicken or lamb) to suit every taste. Or for a quick, healthy and tasty meal at the end of a long day, try our ready-marinated stir-fry selections, which come in a choice of flavours. Our puddings are the stuff of legend. Made in the traditional way with the freshest, highest-quality ingredients, our black puddings, white puddings and haggises are bursting with flavour. Try them once and you’ll want to come back for more! We offer a fantastic selection of kitchen-ready products, such as Chicken Highlanders, Bombay Chicken, Piri-piri chicken, chicken olives, beef olives, BBQ ribs, all seasoned or marinated, ready for the oven. The choice varies every week, so pop in to see our latest selection. "Got to try your Irn bru sausages at the Perth Show & they are amazing. Will definitely be in for more!" "On a trip to Perth, we were told about Lindsay's butchers. We bought their iron brew and sweet chilli sausages. They are the best we have ever had and always buy them when we visit family." "Get my butcher meat here every week, best steak pies in the toon. Great banter and the best cheek you can get anywhere." "Visiting Perth on holiday & we frequented this butcher several times. Each time the meat was exceptional and it had us going back for more. "The best steak pie we've ever had! Gravy rich, beef tender and crust crispy. "Rib roast beef is excellent on a sandwich or roll,best i ever tasted."